This comprehensive collection is the first full book-length volume to bring together writing focused around and inspired by the work of John Rickford and his role in sociolinguistic research over the last four decades. Featuring contributions from over forty leading scholars in the field, the volume integrates both historical and current perspectives on key topics in Rickford’s body of work at the intersection of language and society, highlighting the influence of his work from diverse fields such as sociolinguistics, stylistics, creole studies, and language and education. 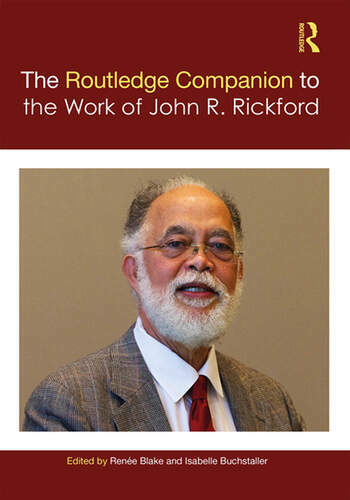 Taken together, The Routledge Companion to the Work of John Rickford serves as a platform to showcase Rickford’s pioneering contributions to the field and in turn, socially reflective linguistic research more generally, making this key reading for students and researchers in sociolinguistics, creole studies, stylistics, and language and education. The English words in Sranan: From where, from whom and how? Style: The presentation of self in everyday life – to an empty theater? Renée Blake is Associate Professor in the Department of Linguistics and Department of Social and Cultural Analysis at New York University, USA. Isabelle Buchstaller is Professor of Varieties of English at the University of Duisburg-Essen, Germany.